I am supplement-aholic on 49 pills a day! * Reading time is 2 min. * It is my honor to follow me by click on (+Follow) on bottom right corner. I entered my room and immediately started to laugh when I saw how my maid organized my pills on a tray. They were organized by size. Since then, I have started to wonder if I have become a supplement-aholic. 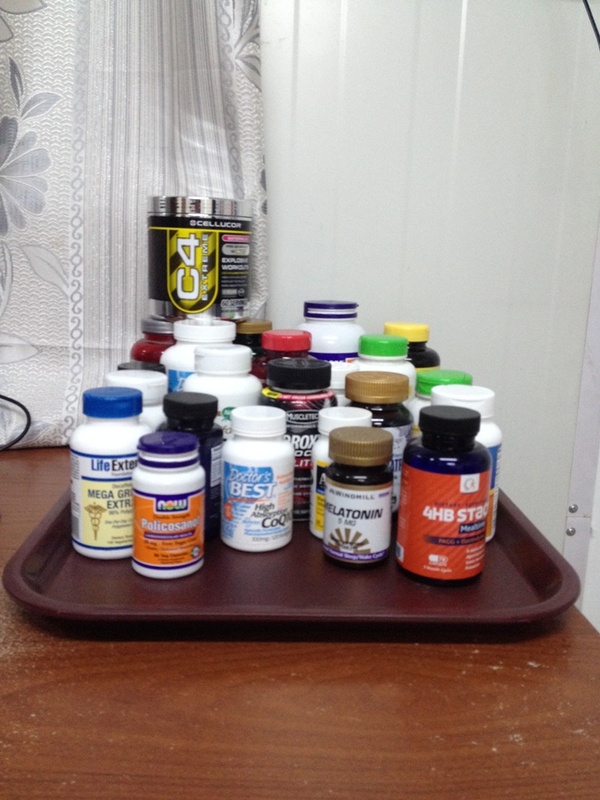 I consume an average of 49 pills a day ranging from concentrated vitamins to workout supplements. Every person that enters my room or with whom I share this information, is shocked. Here’s how it all got started: I have a strong motivation, driven by a desire to be the best of what I can be – mentally, emotional, physically, and financially. We may not have control over our financial situations for many reasons. But, I truly believe, we have 100% control over our mental, emotional, and physical status. I train myself on these three levels every day in every situation as much as I can. When I discuss this topic with people around me, they all have the same common response:“It is bad for you, I don’t believe anymore in what doctors, researchers, or pharmaceutical companies are saying. All these companies are driven by self-interest to make money.” They are not willing to accept my point of view that medical advances and new research comes out every day with new knowledge. The interesting part is that every single person with whom I interact believes I am crazy. Most likely, you do too by now. They believe most of these studies are fake, sponsored advertisements, and hold no credibility. It seems that with these people, the industry has lost all credibility. And why not! For years they have heard doctors say: “An apple a day, keeps the doctor away”, until another doctor says: “No, it (referring to the apple) is all sugar (bad!)”. Or yet better, for thousands of years, humans have eaten bread. But, now doctors are preaching a new anti-gluten movement. I consume these pills and workout supplements, because I trust in these new studies presented by these doctors in their books such as Dr. David Perlmutter, author of the book, “Grain Brain”. I imagine a funny future for the restaurant and food industry for people like me. In the future, I’ll go to a restaurant and rather than having salt and pepper on the table, I will see a few supplements such as Green Tea, Alpha-Lipoic Acide 600, or Omega 3 fish oil. Or, the waiter will ask me if I would like to add a spoon of protein (30g of MP core series) to my orange juice. Or better yet, an extra menu listing all types of vitamins and supplements with prices. Me: Hi, can I have chicken salad? Waiter: Sure, what type of vitamins would you like to add? Me: how about 2 pills of Turmeric, 2 of Best alpha-Lipoicacide (doctor’s best..Please! ), and 1Resveratrol 500mg. Waiter: Sure, will that be all, sir? Me: No! How about 1 scoop of Cookies ‘N Cream protein (Muscle Pharm..Please) with my Stress-b VitaminWater? Waiter: Sure, sir! Will that be all? « We all have an “Off Button”…Will it get pushed today?